11 december, 2006 Säg något! As people might know Nintendo Wii was released in Europe on Friday the 8th of December. A friend of mine “Kundkorgen” had bought it. And came all the way from his home down to another friend Ezakiel. Of course he brought his Wii with him. So me and my other friend Elden, went over to Ezakiel to try it out. And to meet with Kundkorgen to of course! Hadn’t seen him in a long time! So there we where, in Ezakiel’s basement. Touching and feeling the Wii. God it’s gorgeous! So we got to try Wii Sports. Love bowling. Well since me and Elden couldn’t stay very long we decided that we would come over again on Saturday. Which we did, and later wen’t home to Elden and played there. I have to say this is the most fun I’ve had in ages! And I really do mean it. Thank you guys, I hope we can have as much fun again soon! 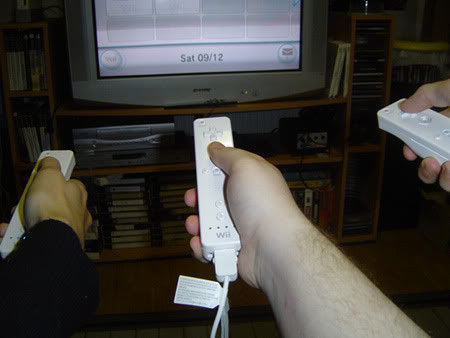 Here’s a picture of us… Well at least our hands when we are touching the Wiimotes. Kundkorgen, Me & Elden. Ezakiel took the photo.